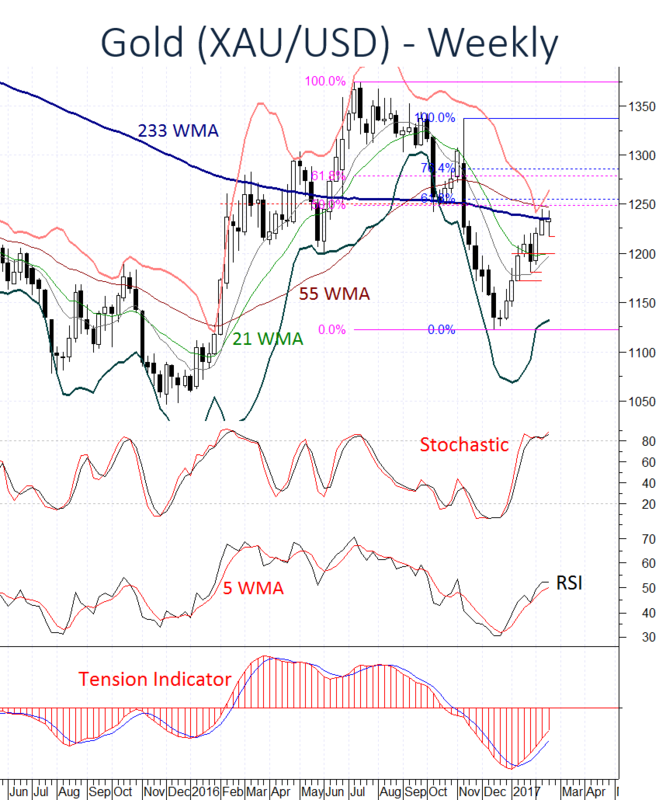 Gold prices have failed to maintain recent gains, with prices consolidating beneath the USD1244.67 high of 8 February. A short-term corrective pullback is looked for, as bullish daily studies unwind. However, any break below congestion around USD1200 should stabilise above the USD1180.65 low of 27 January, as the Tension Indicator continues to strengthen and background readings improve. In the coming weeks, Gold prices are expected to continue higher, with a close above the USD1248.50, (50%) Fibonacci retracement of the July-December fall and the USD1255, (61.8%) Fibonacci retracement of the November-December fall opening up the USD1278.40, (61.8%) Fibonacci retracement and the USD1286.60, (76.4%) Fibonacci retracement. An unexpected close below USD1180.65, however, will turn investors cautious once again, as the USD1150 break level then attracts.